Doesn't the swan look majestic. Another lovely shot of one of our many beautiful birds. Absolutely fantastic shot, nice one! Phil you have certainly caught the moment. With the sun showing the wings of the swan in a very interesting pose, shows all the swans feathers in detail. The boy is looking a little worried as well. With movement by all the birds in the picture. Calming picture of family life at the waters edge. Well done you. The lad's safe, peterp - the swan can't see him. He's wearing camouflage. peterp. I can't see any harm in what the boy is doing, he's just observing. I bet his feet are cold though lol. I suspect that the boy is not as near to the swan as the photograph would suggest. Using a 'long lens' can often have the effect of compressing the perspective. 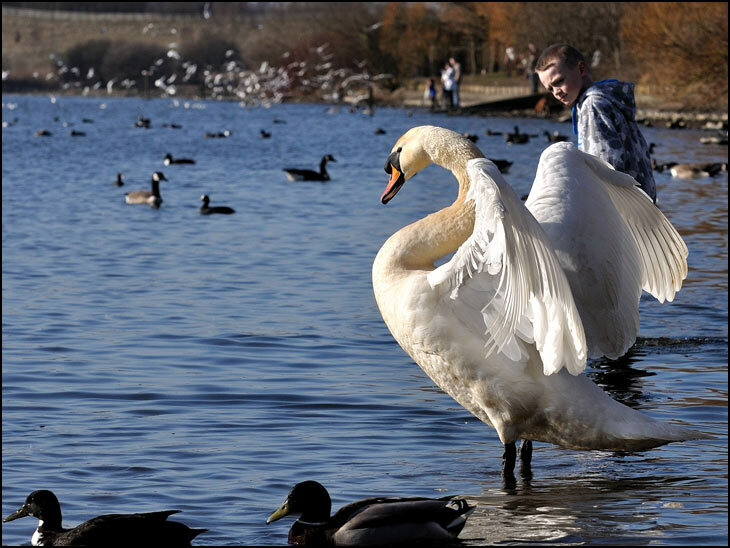 Great photo :)I love how you've captured the swan's elegance, great details on the wings! Looks like a fantastic and popular place to go bird spotting! I was wondering if you can submit your own photos on Wigan World? Waiting for a comment from Chuck. It's another bird. Get your own camera out and gives us something better. It looks like a Liver Bird.